The table below sets out many [but not all] of the sources that you will need to consult when researching families and localities in Co. Londonderry and North Antrim. The table indicates the sources available for different periods of time. Within this website most attention is paid to the period c.1850 to c.1930. Info. from family circle. Info. from family circle. Possible, but very unlikely. Possible, but less likely. Civil Records - All BDMs from 1864. Newspapers - BDM notices - increase towards 1920. Civil Records - Non-Catholic Marriages from 1845. Newspapers - only a few. 1901 & 1911 Census Returns. 1851 Census Returns for parts of Co. Antrim. 1831 "Census" for Co. Londonderry. 1803 Agricultural "Census" for parts of North Antrim. N. Ireland General Revaluation of 1935 plus revisions and later revaluations. Registry of Deeds - from 1708. Street Directories Street Directories Street Directories . School Records School Records . .
* Also seen as a census substitute. Clicking on the links in the left-hand menu will take you to webpages that contain information on the nature of each source, whether it is universally available within the area covered by this website, some guidance on how to use it and where you can access it, particularly online. The right-hand menu contains links to databases that I have created from census substitutes that relate to Co. Londonderry and North & Mid Antrim, covering the period c.1630 to c.1860. Also, you might want to read my paper - Some thoughts on researching families and localities. Both the order of the links in the left-hand menu, and the same order adopted in the table above, might give the impression that you should always begin with BDMs, then move on to Census Records and then on to Valuation Records.The diagram below is a better representation of the search process for the period c.1850 to c.1930. You can begin anywhere you wish. It really depends on the initial questions that you are asking and that depends on "where you are coming from". 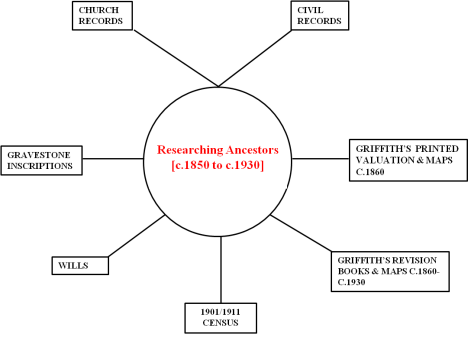 The diagram below is assuming that you are primarily interested in researching ancestors so the key records are arranged around the centre circle. If your main intention was to research a locality - then the diagram below would be a bit different - but more or less the same sources would be involved - read more. and its revisions will allow the search to continue well into the twentieth century. Civil and Church Records not only provide the basic genealogical information, they also indicate where the family lived at different periods. Civil marriage certificates are particularly important because of the fact that they give the names of the fathers of the bride and groom, thereby providing a gateway to the previous generation. The Griffith's Printed Valuation of c.1860 lists the occupiers of houses and land by townland and street within the region. It is often seen as a substitute for the 1861 Census. However, its great value is that it gives details of the holdings held by each occupier and assigns numbers and letters to the land and houses on these holdings. These numbers and letters are also shown on large scale maps that allow us to identify exactly where our ancestors lived in the middle of the nineteenth century. Perhaps the most important source is the online 1901/1911 Census. These census returns provide a gateway back into the nineteenth century and a starting point for the "journey" towards the present. As well as providing socioeconomic data and detailed information on all persons living in the house on the night the census was taken, it also shows us where each family was living within a townland or street. However numbers assigned in the census to the houses where each family lived should not be treated in the way that we treat modern street numbers. To find out exactly where a family lived in a street or townland it is necessary to match the list of houses in Form B1 in the census with the houses listed in the Griffith's Valuation. For more information on this process go to the Valuation Records webpage. This process has now become easier because the three key sources necessary for its success are now available online viz. the Printed Griffith's Books and Maps at askaboutireland.ie - the Griffith's Revision Books at PRONI - and the 1901 and 1911 Census at NAI. As you move back into the earlier part of the nineteenth century evidence on families and localities becomes more limited and is often circumstantial. The real problem is the availabity of BDMs. Church registers are not always available and those that are can be patchy with regard to dates and usually do not contain as much information as later registers or civil registers. Remember, however, that Protestant civil marriages date from 1845. The table above lists a number of sources that are generally known as census substitutes and although, evidence from these is often circumstantial, they may prove fruitful. I have databased many of these and you will find links to these databases in the right-hand menu. For locality studies estate records can be the most useful source but unfortunately they are not always available. Going back into the eighteenth and seventeenth centuries becomes even more difficult. Often all we can do for this period is to look for a family name in census substitutes such as the 1740 Religious Returns or the Hearth Money Rolls of the 1660s. However, without the evidence from church registers, which is often absent, the name does not become a person. In order to use any of these sources you need to know something about administrative divisions within counties. This information is provided at the Administrative Divisions link in the top menu. The top menu also contains a link to Case Studies where you will find working examples of the process of researching families and localities in Co. Londonderry and North Antrim, particularly in the nineteenth and early twentieth centuries. Below are links to the repositories that house the above records. The most important of these repositories for researching Ulster ancestors is the Public Record Office of Northern Ireland [PRONI], Belfast. These repositories have now more material online - particularly useful is the PRONI eCatalogue. I have also included links to the GRONI and GROI which hold civil records of births, deaths and marriages. Note that each of the links below will open in a separate window or tab.